There's been a lot of speculation on who or what is going to win an Oscar Sunday night. Will it be the crowd favorite, like Julia Roberts? Or will it be a relatively unknown like last year's winner, Hillary Swank? Will it be an adventure like Gladiator or the critically acclaimed foreign entry, Crouching Tiger, Hidden Dragon? Will Tom Hanks be passed over because he's already won two Oscars in favor of Aussie hunk Russell Crowe? Is it possible to predict who will win the coveted gold statuette? Do the Golden Globes and other awards affect the outcome of the Academy Awards? CBSNews.com looked at past awards to see if it could divine this year's winners in seven major categories: Best Picture, Best Screenplay, Best Director, Best Leading Male, Best Supporting Male, Best Actress and Best Supporting Actress. Using 25 years of Golden Globe awards, presented by the Hollywood Foreign Press Association, to predict Oscar winners is a somewhat dicey proposition. Results varied by category from Best Actress, in which 80 percent of the Golden Globe winners also took home an Oscar, to Best Screenplay, in which only 28 percent of Golden Globe honorees won an Oscar. The Golden Globes muddies the picture a bit in the Best Movie category by splitting the honors into Drama and Comedy classes. But they did suggest an Oscar winner 72 percent of the time. Golden Globe Best Actors won Oscars 76 percent of the time, but only 52 percent of the Best Supporting Actors went on to Oscar gold. For for Best Supporting Actress, the percentage was even lower - 48 percent. Sixty percent of the directors honored at Golden Globes went on to win the Oscar Best Directo award. The Screen Actors Guild awards are only seven years old, but they appear to be a little more on the money in predicting Oscar winners. SAG voters have an astounding 100 percent rate in predicting the Best Actor, but only a 20 percent rate in picking their equivalent of Best Picture. They picked the Best Actress, Best Supporting Actor and Best Supporting Actress 66 percent of the time. 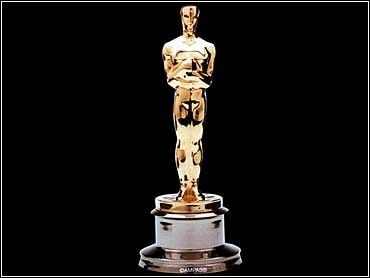 This was the first year that the British Academy of Film and Television Arts presented its awards prior to the Academy Awards, so their track record as a predictor is unknown. The truly interesting race should be for Best Picture with Traffic, Gladiator and Crouching Tiger, Hidden Dragon all having picked up major awards. The Screen Actors Guild and the New York Film Critics picked Traffic as the best flick. Gladiator was chosen by the Golden Globes and the Broadcast Film Critics Association. Crouching Tiger, Hidden Dragon delighted the Toronto Film Critics Association and the Los Angeles Film Association, while the Golden Globes named it best Foreign Film.